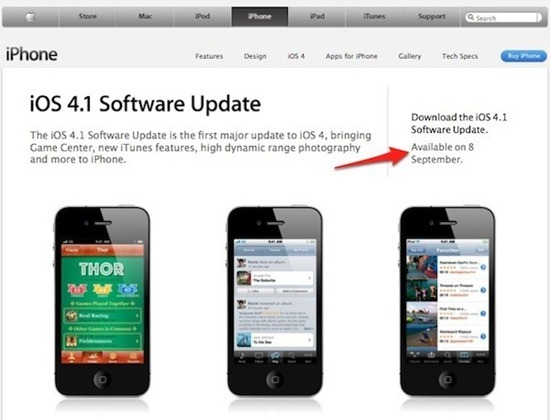 The official UK website of Apple has this confirmation up on the site that iOS 4.1 for iPhone and iPod touches will drop on Wednesday, September 8th. This is probably the same day when the new iPod lineup for fall 2010 (iPod nano, iPod shuffle and iPod touch 4G) will also go retail. If your iOS device relies on a jailbreak or a carrier unlock, make sure you keep your “clicky” fingers away from that tempting “Update” button in iTunes until and unless new jailbreak and unlock tools are available. There is currently no ETA (Estimated Time of Arrival) as to when can we expect these new tools to be made available. But I am pretty sure that they will be released once they are ready for primetime use! Till then, make sure that you have PDF Patch installed from Cydia on iOS 4.0.1 to keep your iPhone, iPad or iPod touch safe from PDF vulnerability in iOS 4.0.1. If a jailbreak has been found for 4.0.2 on the 3GS and iPhone 4.. will this be released when 4.1 is out. When do you think the new jailbreak will come? Great News! I´m waiting ansious on the new tools since I´m still stucked with a new iphone on 4.0.2. So if i have Iphone 4 with 4.0.2 i should stick to 4.0.2 not go with 4.0.1 as there is a higher chance for me to jailbreak/unlock my Iphone ?